Looking to rent or buy a Probst EP-Uni Handscreed 290? With Depots in Naas – Cork – Dublin, we have you sorted with our Probst EP-Uni Handscreed 290… Call Hireco Plant and Tool Hire today on 045 874 433. We are here to help! The EP-UNI is an optimal hand-tool for an economical performance of smaller and mediumsized sites. With this device you do it quicker, easier and better. Continuously adjustable telescopic elements. With only one system you can screed different working widths easily and exactly. EP-UNI is adjustable to the required working width between 900 and 2,300 mm respectively between 2,300 and 3,000 mm. With two telescopic elements the basic Aluprofile can be enlarged by maximum 700 mm. Flanged at the sides, optionally available height-adjustable roller units take the height off existing kerbs, pavers or similar. This is possible not only with the basic element but also with the telescopic elements. No further rail gauges are necessary, thus granting additional timesaving! Including special key for fast mounting of the telescopic elements and the roller units. No torsion with the strong Alu-profile, even at working-widths up to maximum 3 m! 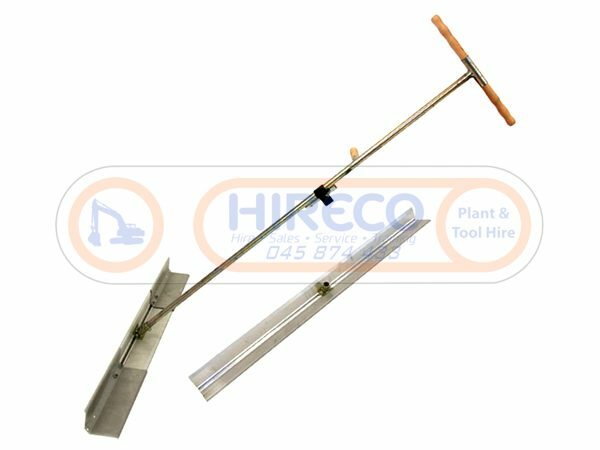 Due to special design, the profile does not leave the screeding rail even when working with large quantities of screeding material. The three-dimensional handle of EP 230/300 is adjustable to the required anglepositioning. The special design of the handle enables the operator to use the weight of his body to exert pulling force in every position of the EPprofile. With the 900 mm EP the screeding material can be carried and filled exactly into the gaps left by the screeding rails, for example waterpipes.